Collecting energy at a low or zero cost and using it on demand brings major advantages for hot water and central heating applicable to domestic use, as well as to commercial and industry installations. More than 50% of the entire power demand in Germany is needed for heating, with only 20% required for electricity. This increases to 85% of energy demand used for heating domestic properties. Regardless of whether a home, apartment or commercial premises, self supply thermal energy reduces energy costs significantly and permanently. Therefore a heat storage tank is the crucial element since it provides the link between power generation and usage. It has to be able to store energy over great periods of time and then deliver it on demand in the right quality and quantity. Investors are being offered packages by the industry: systems technology containing all the components of the production, storage and distribution of thermal energy. Package prices are lucrative, but what about the effi ciency and sustainability? 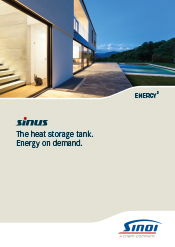 A heat storage tank requires sufficient space within the building. When carrying the tank into an existing property there is often a conflict between its size and space available in terms of entrances, corridors and stairs within the building. This can lead to tanks being specified that are insufficient to the demands required by the property or the need to link multiple smaller tanks which brings its own technical challenges. An incorrect set up or using the wrong components will lead to high energy loss. Whilst the original investment costs may be lower, the installation will result in higher servicing costs over the following years. SINUS guarantees a life expectancy of over 30 years.